New around here? find out what makes KeyToTheBible.org different? The Bible teaches that Christ will return personally, visibly and literally. “While they (the apostles) looked stedfastly toward heaven as he went up, behold, two men stood by them in white apparel; which also said, Ye men of Galilee, why stand ye gazing up into heaven? This same Jesus, which is taken up from you into heaven, shall so come in like manner as ye have seen him go into heaven” (Acts 1:11). Jesus continually taught he would go but later come again. “For the Son of Man shall come in the glory of his Father, with his angels; and then shall he reward every man according to his works” (Matthew 16:27). Jesus spoke of himself in a parable as a nobleman: “A certain nobleman went into a far country to receive for himself a kingdom and to return … And it came to pass, that when he was returned, having received the kingdom, then he commanded these servants to be called unto him…” (Luke 19:12-15). 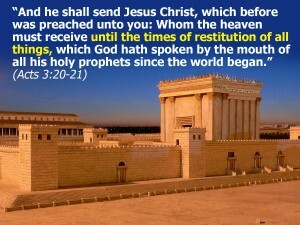 The Apostles preached the Lord’s return. Peter said: “He (God) shall send Jesus Christ, who before was preached unto you; whom the heavens must receive until the times of restitution of all things which God hath spoken by the mouth of all his holy prophets” (Acts 3:20). Paul wrote: “The Lord Jesus shall be revealed from heaven, with his mighty angels … when he shall come to be glorified in his saints, and to be admired in all them that believe … Remember ye not that when I was yet with you, I told you these things?” (2 Thessalonians 1:7, 10; 2:5). 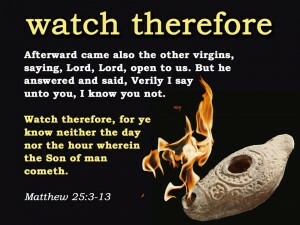 The Apostles taught believers to expect and prepare for the coming of the Lord. “Looking for that blessed hope, and the glorious appearing of … our Saviour Jesus Christ” (Titus 2:13). “To them that look for him shall he appear the second time without sin unto salvation” (Hebrews 9:28). “A crown of righteousness… to all them that love his appearing” (2 Timothy 4:8). “He shall judge the living and the dead at his appearing and his kingdom” (2 Timothy 4:1). “Hope to the end for the grace that is to be brought unto you at the revelation of Jesus Christ” (1 Peter 1:13). The Prophets (Old Testament) foretell his coming in power and great glory. “That he may send Jesus Christ … whom heaven must receive until the times of restoration of all things… All the prophets from Samuel and those that follow after, as many as have spoken, have likewise foretold of these days” (Acts 3:21,24). “I saw in the night visions and behold, one like the Son of man came with the clouds of heaven” (Daniel 7:13). “The Lord will come with fire and with his chariots like a whirlwind, to render his anger with fury and his rebuke with flames of fire” (Isaiah 66:15). © Copyright 2011 BHWNE. All rights reserved.